New York: Dell, Sloan & Pearce. Hardcover. Dust jacket has minor chipping. . Very Good. First Edition. New York: Duell, Sloan & Pearce, 1946. First Edition. First printing Fine in decorated cloth covered boards with red title block and gilt text on the spine. In a very good+ dust jacket with a 1" by 1/4" deep chip at the top of the front panel, a price clipped flap and light rubbing to the spine. The 16th volume in the American Folkway series. This book covers areas of eastern Tennessee and portions of northern Georgia and Alabama. Duell Sloan Pearce, 1946. 1st. Hardcover. A FINE tight crisp copy with a Near FINE bright dj. New York: Dell, Sloan & Pearce, 1946. 1st. hardcover. Near fine/very good. Bound in the publisher's original cloth over boards, spine and cover stamped in red. Dust jacket is chipped at the head and heel, closed tear on the bottom edge. Edited by Erskin Caldwell..
Duell, Sloan & Pearce. Used - Acceptable. Former Library book. Shows definite wear, and perhaps considerable marking on inside. Ayer Co Pub, 1971-06. Hardcover. Good. New York: Duell, Sloan, & Pierce, 1946. First Edition. Hardcover. Very good/good +. Octavo. xxiii, 244 pages. Light cloth hardcover with title on spine. Illustrated dust jacket with title and photograph on front. Title on spine. Hardcover in very good condition. Light shelf and edge wear to dust jacket. New York: Duell, Sloan, & Pierce, 1946. First Edition. Hardcover. Very good/good. 8vo. xxiii, 244 pages. Light cloth hardcover with title on spine. Illustrated dust jacket with title and photograph on front. Title on spine. Hardcover in very good condition. Light shelf and edge wear to dust jacket. Small taped area on jacket upper front edge. Ayer Co Pub. Used - Acceptable. Ships from Reno, NV. Former Library book. Shows definite wear, and perhaps considerable marking on inside. 100% Money Back Guarantee. Shipped to over one million happy customers. Your purchase benefits world literacy! New York: Duell, Sloan, & Pierce, 1946. First Edition. Hardcover. Very good. 8vo. xxiii, 244 pages. Light cloth hardcover with title on spine. Hardcover in very good condition. No dust jacket. A good reading copy. 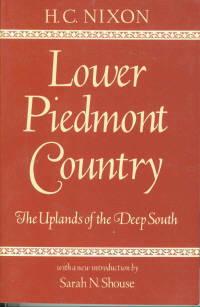 Lower Piedmont Country: The Uplands of the Deep South. (The Library of Alabama Classics). Wraps, octavo, pp. xlvii, 238 plus index. Very good in the publisher's glossy wraps. Univ of Alabama Pr, 1984. Trade Paperback. Very Good. Duell, Sloan and Pearce, 1946. Hardback in very good + condition with very good minus condition dust jacket. Mylar sleeve is taped to dust jacket.. Hardcover. Very Good/Very Good. Duell, Sloan & Pearce. Used - Good. Former Library book. Shows some signs of wear, and may have some markings on the inside. Duell, Sloan & Pearce. Used - Good. Ships from the UK. Former Library book. Shows some signs of wear, and may have some markings on the inside. 100% Money Back Guarantee. Your purchase also supports literacy charities. New York: Duell, Sloan & Pearce. Very Good condition,spine sticker residue. 1946. 1st Edition. University, AL: Univ. Of Alabama Press. Paperback. 1984. Reprint. 8vo 244pp . Fine with no DJ. Reprint of a book published in 1946. This edition has a new introduction by Sarah N. Shouse. The classic examination of the Southern hill-country surveys the history, politics, religion, economy, and folkways of the region as the author knew them in the Great Depression and World War II .